The house was a dilapidated jigsaw puzzle with missing pieces. Innocuous black snakes often found their way inside through the ill-connected joints. Rags filled the broken window panes, a barrier against the frigid air. It was a sorry sight to most, but it was home to me. There were seven of us. Poor as hanks, survival meant eating whatever was set before you. Squirrel, rabbit, or deer, we didn’t ask. We weren’t worried so much about saving the planet back then as we were about saving ourselves. Dad worked continually, but he never seemed to catch up. It was either feast or famine, there was no in between. So more times than not, we did without. My twenty-two-year-old mom tried her best to keep five kids happy. One particularly cold day while camping in the kitchen with just the stove to keep us warm, she threw a blanket over the table and we all climbed under, our imagination doing the rest. For a while, we played oblivious to our persistent problem. The need for food. But Mama was praying. And God was listening! Around lunch time, my granny, Mattie and my great-granny, Blanche, brought two whole fryers expecting to fry them, until Mama explained she had no grease. Blanche asked for butter. Mom gave her all she had–several small pieces from blocks she used to butter her pans when cooking (Before the days of Pam). Undaunted, Blanche melted the butter and pan-fried the chicken. Then she made butter gravy with the drippings. 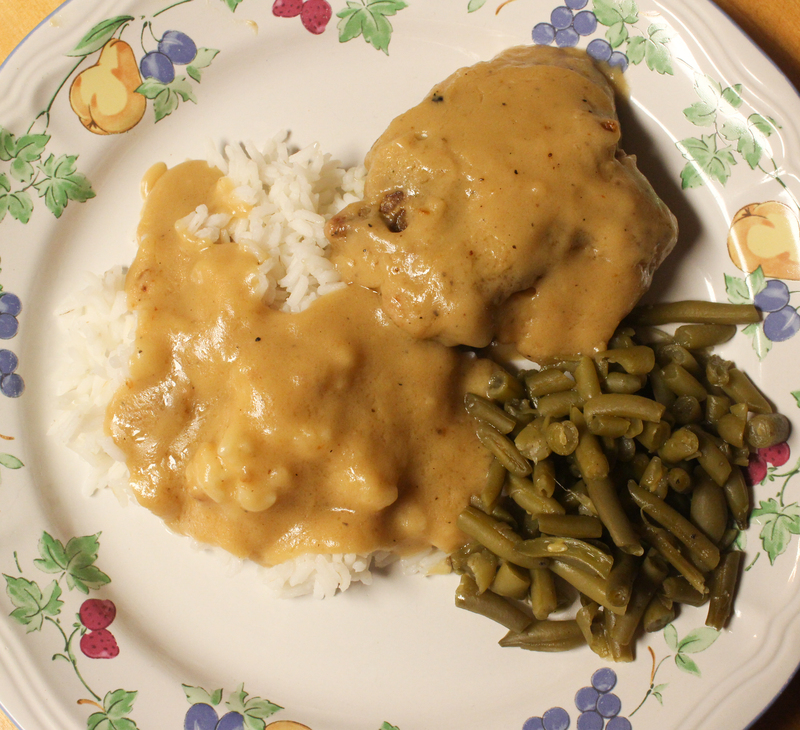 We feasted on the best Chicken ‘N Gravy we had ever tasted before—or since. I make this recipe when I want comfort food. Back then I didn’t eat much. I didn’t like deer, rabbit, or squirrel. And I refused to eat fried bologna! So when I found something delectable, I kept it near my heart. Each time I eat this dish, I’m reminded I am more valuable than the sparrows. Place butter in pan or Dutch oven and heat until butter sizzle. Brown a few pieces at a time, turn, and cook until tender. Combine flour and salt. Add to drippings to make a roué. Stir until medium brown. Return chicken to the gravy and allow to simmer 5-10 minutes. Serve with rice, homemade biscuits, or pasta, and a salad. Note: With different chicken pieces comes more drippings. Reduce drippings and flour as needed to make perfect gravy. The more you make this recipe and become familiar with it, adding more or less of things, the better it will taste. Do you have a favorite dish that reminds you of God’s goodness? Have you ever had someone to show up at your door just when you needed a helping hand? Oh, Gail, you sound like my family. We moved 60 (yes, 60!) times, covering states from GA to CA, before I was 16! The three states we landed in most were, GA, TX and CA. My mom couldn’t eat anything in the bird family so we ate mostly fish that dad caught and lots and lots of vegetables. We went hungry more times, than I care to think about, lived in our car, dilapidated shacks or, one time when we were migrant workers, we shared quarters. What a life and my poor dad worked anywhere and everywhere that would hire him, he just couldn’t keep up with his ever growing family. Many, many times we were helped by kind, generous, loving people. Thanks for some good memories, and the chicken recipe! We are truly kindred spirits, RobbyeFaye! Even a GA girl for a while. I like that. I won’t say those were the good ole days, but they are part of me. And looking back, I know I was blessed then and I’m blessed now. Blessings to you, my friend! I agree about the “good ole days” and we were blessed many, many times! God’s Blessings to you, too!